Warmer temperatures aren’t the only thing inspiring us right now. With an appetite for burgeoning trends, Domino editors scoured the stalls at New York’s newest It trade exhibit—Shoppe Object—in search of need-to-know voices and forward-thinking designs. The show, which officially came to a close on February 4, featured a curated roster of 200-plus visionaries, industry veterans, and makers with only the best and brightest items to share. New nudes, vibrant linens, and anatomically inspired ceramics were just a few unexpected surprises we loved along the way. Ahead, five Domino editors share the pieces that left them wanting more. Leave this lavender lamp on a tabletop for an elevated look or mount it on the wall for a three-dimensional moment. Virginia Sin channels the human body with this new vessel inspired by small blood vessels coming together to create a unique home for found blooms, dried or alive. Vibrant color combinations and unexpected pattern work punctuate Archive’s latest dose of pillows, blankets, and home accessories. Tap into your inner O’Keeffe with this playful wheel from Fredericks and Mae or display it solo as a standalone art object. In keeping with their chic-meets-practical ethos, Areaware’s newest debut comes in the form of bold shelving staples designed to keep your heaviest books in place. Crafted from rapidly cooling lava, Alder’s jet-black obsidian facial roller is one chic way to relieve tension. This colorful onslaught of relaxed quilts made of Belgian linen and woven and stonewashed in Portugal is the newest addition to Hawkins New York’s Simple Linen Collection. Virginia Sin’s coil-built hooks will meet all our hanging, draping, and cloaking needs this year. 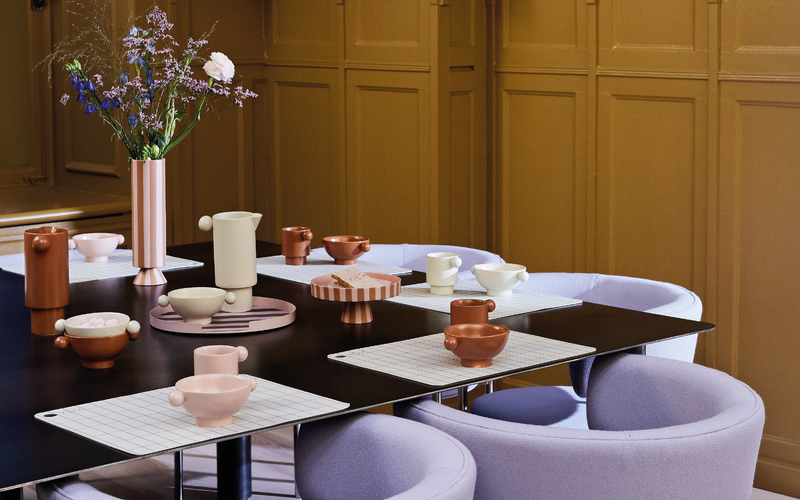 Capturing modern Danish simplicity in one seriously stylish pot, OYOY’s newest picks left us craving moody terra-cottas and barely there pinks. One part incense holder and one part candlestick, this otherworldly find from Light and Ladder will catapult your aroma game into a new dimension.